Being the son of one of the Netherland’s most famous auctioneers, Pieter Jan Glerum has never been a stranger to fine art and its inherent elitism. However, it was exactly this inaccessibility to the masses that made Glerum come up with a website that would allow anyone to anonymously send in his/her artwork, and the masses to show their support for the work through social media. 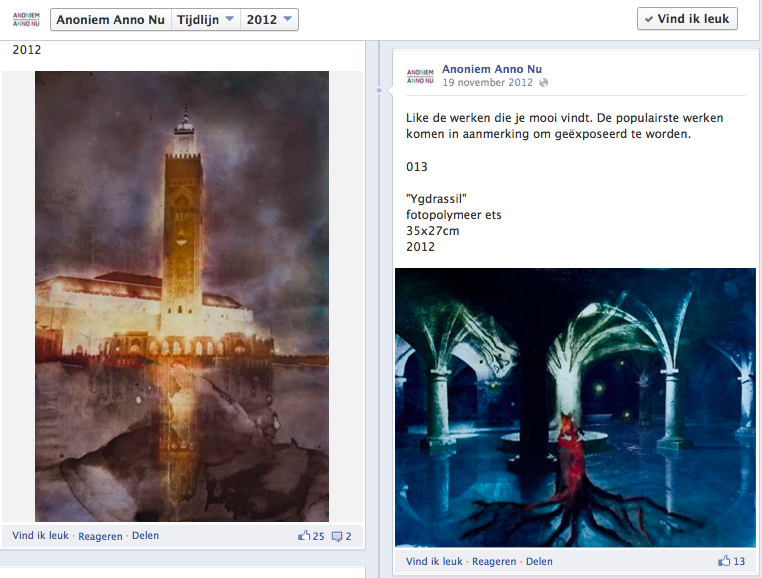 In short, Anoniem Anno Nu (AAN) brings democracy to the world of art. 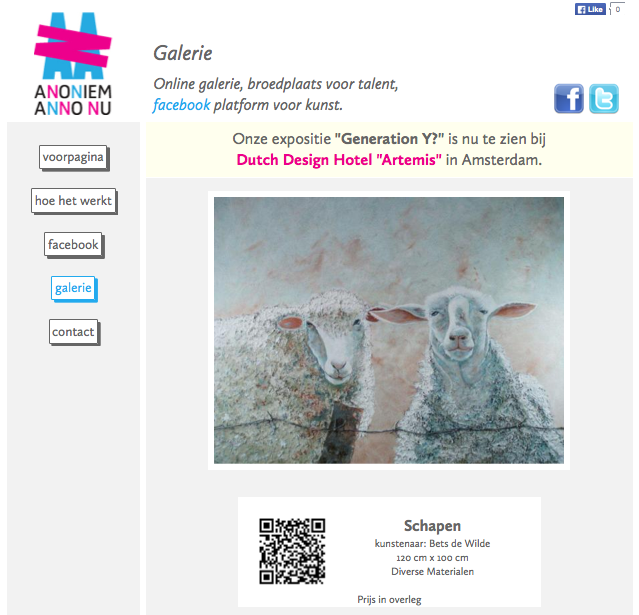 AAN is a wonderful example of co-creation through crowdsourcing – as anyone can sell their art and, equally, anyone can vote and buy the art – and the two-sided market (or platform) – as it brings together artists and art enthusiasts. The difference between the two-sided-market and the traditional value chain is that the prior allows networks of users that are attracted to each other come together. As such, the more users the platform attract, the more revenue it can generate. Here lies the crux: AAN currently has nearly 1.300 likes (or followers), which hardly makes it profitable. What to do to increase the amount of users and profitability of this platform? The answer can be found in Eisenmann, Parker & Geoffrey’s (2006) article ‘Strategies for Two-Sided-Markets’ that was published in the Harvard Business Review: a business model suggestion, if you will. The first problem: getting the pricing right. In two-sided-markets there is more often than not a ‘subsidy’ group that, when attracted in large enough numbers, will draw the ‘money’ group that is willing to pay for access to the prior group of users. According to this model, Glerum will most likely need to ask the small group of break-through artists – waiting to access a large group of eager-to-spend art patrons – for a small fee. At this moment the process is free, with the exemption of a 10-15% mark-up over sales. At the same time, AAN could charge premium art patrons for a small fee too, in order to gain access to more renowned artists on the site. This brings us to the second point. Join forces with ‘marquee’ users: artists that have already made a name for themselves or that have a buzz around them to join in on the platform. This will attract new (premium) art enthusiasts on the side of buyers. Moreover, it will add to the credibility of the platform as a whole, both on the artist’s and the art enthusiasts’ side as the marquee users can sell, buy or review works on Facebook. Lastly, envelop the idea to attract a broader range of consumers. Two great examples are the affordable art prints from “20×200” and the Rijksmuseum’s “Rijks Studio“, which allows you to take artworks and creatively apply them to any kind of DIY project (e.g., an iPhone case, furniture fabric or even a motor vehicle). Eisenmann, Thomas, Geoffrey Parker, and Marshall W. Van Alstyne. “Strategies for two-sided markets.” Harvard Business Review 84.10 (2006). Malone, Thomas W., Robert Laubacher, and Chrysanthos Dellarocas. “The Collective Intelligence Genome.” MIT Sloan Management Review 51.3 (2010). Majchrzak, A., and A. Malhotra. “Towards an information systems perspective and research agenda on crowdsourcing for innovation.” Journal of Strategic Information Systems 22.4 (2013). Previous PostGrooveshark – Search. Play. Discover.Next PostCollective Hyperintelligence or Hypercollective intelligence?